Ever since I studied modal logic and got to know possible world semantics, Lewisian modal realism and the counterfactual structure of thought experiments in details as a philosophy undergrad, thinking on philosophical problems with the possible world toolset became a second instinct. Please see 2 references here I used amongst others, like classical texts: the Possible Worlds entry of Stanford Encyclopedia of Philosophy, written by Christopher Menzel and Accessibility relation entry of Wikipedia. To briefly put: possible worlds describe possible – largely, but not necessary spatiotemporal – situations that express of something being the case. 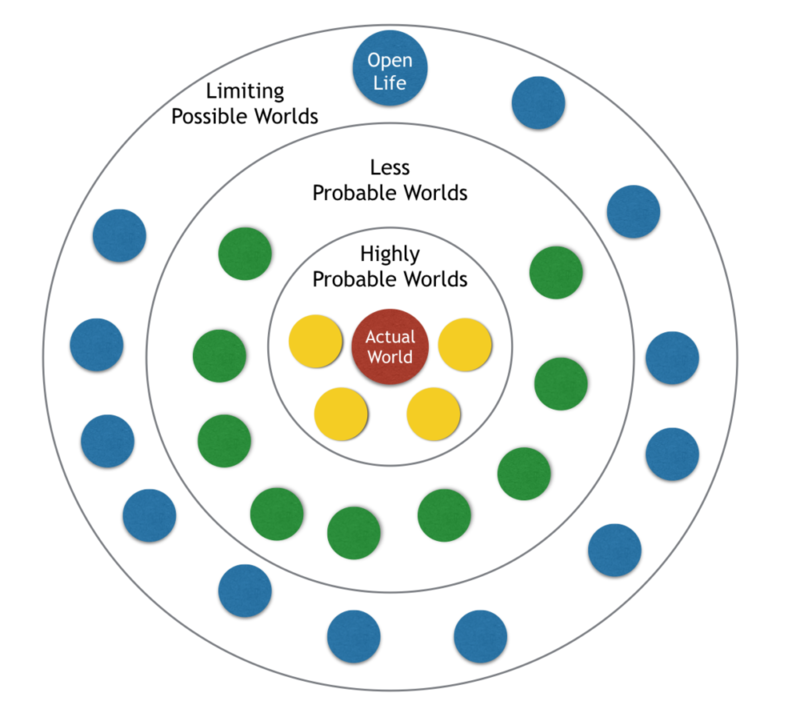 Possible worlds are accessible from each other through an accessibility relation that can be defined various ways. With the basic concepts of worlds (and its parts or situations and its components) and accessibility the 2 most basic modal concepts, necessity and possibility can be interpreted in terms of quantifying over possible worlds, just like classical first-order propositional logic quantifiers. So the truth conditions of modal statements involving these 2 operators can be provided with possible worlds. Necessity involves a proposition being true in all possible worlds accessible from each other, while possibility can be interpreted as the proposition being true in some (at least one) such possible world. In the modal realism of David Lewis, possible worlds are all-inclusive entities, including all things spatiotemporally connected to each other. The actual world is our current spatiotemporal world with it’s past and future included due to all-inclusivity. Actuality only has an indexical use that picks out the possible world of where it was uttered. No compositional difference, nothing special compared to other possible worlds. My interpretation will be significantly different compared to the Lewisian concretist one as it is adjusted to describe the change of lifespan and life expectancy in a series of possible worlds all accessible from each other and aims highlight different stages. The application of the methodology has its own priorities. 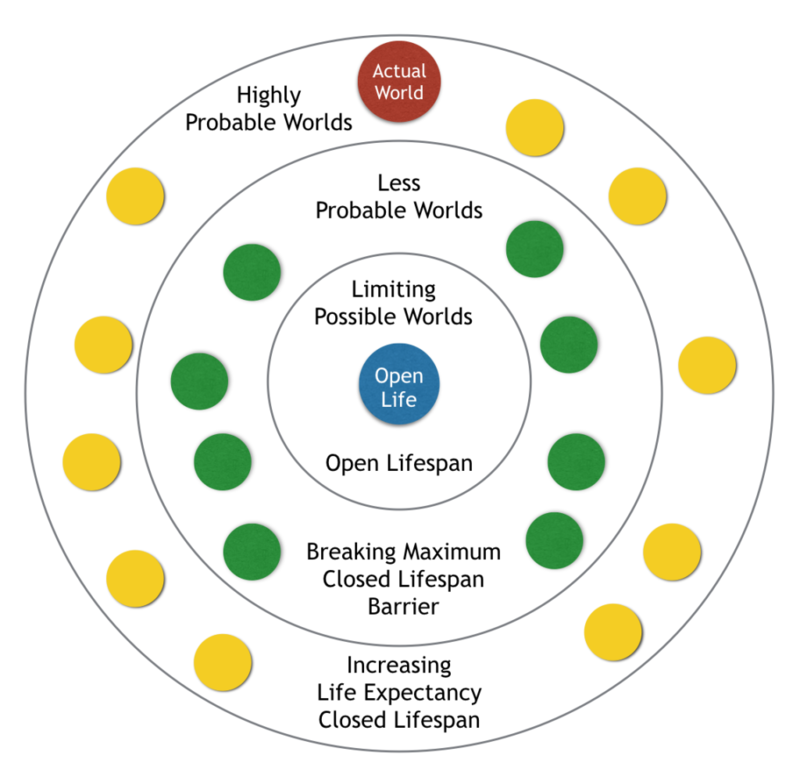 Here we consider Open Life as a possible world, where Open Healthspan Technologies are developed and accessible enough that all people can choose to go through continuous interventions to counteract the biological aging process and have a fixed, small but nonzero mortality rate due to external causes of death. Let’s consider a 1 dimensional scheme of possible worlds. The colours are sort of trying to imitate a heat map. Now let’s consider a radial plot of possible worlds showing some of the network topology of those worlds. 1., Accessibility relations are not shown in this plot between different worlds as all worlds are connected and accessible from each other according to the methodology. 2., Impossible worlds are not shown in the plot as those are inaccessible from possible worlds the way those possible words can access each other. Please note that here am not saying that there’s no connections (imaginative, combinatorial, recombinant…) can be made between possible and impossible worlds. But the type of accessibility relations applied between possible worlds cannot be used between possible and impossible worlds, or between impossible worlds. 3., Here we can interpret accessibility as a temporal relation, or give the accessibility relation a temporal aspect too, besides the basic modal accessibility, intimately related to conceivability. 4., Elaboration on temporality and probability: Our actual world (= reality, highly probable itself) can lead to highly probable worlds, proximally accessible from reality. And those can lead to probable worlds with a lower probability and vice versa. According to 3., ‘can lead to’ mean i., simple modal accessibility and ii., a temporal interpretation. Latter case might be expressed via temporal indexes assigned to the world, so actual world WA is happening at T1 and a subsequent highly probable world WHP is happening at T2 time following T1. But note that although my view is focusing on future worlds to come, it allows temporality to go backwards as ‘vice versa’ indicated. I want to preserve richness of possible world metaphysics as it might come handy later for other purposes. So probability in highly and lowly probable worlds is an indication of how the usage of probability refers to occurrence of future events but temporal accessibility relation can serve as a likelihood relation as well referring to past events with known outcomes. The key reason to use probability as a world meta-property is that theoretically those probabilities can be computed so a probability metric can be assigned to such worlds. The basis of the compute is our understanding of our actual world. But we don’t have to go into details here concerning quantification processes as this is not central to our current concern. 5. ‘Limiting Possible worlds’ are worlds where a particular, quantifiable parameter reached its upper or lower limit.The length of human life is obviously such a quantifiable parameter. Open Lifespan is the upper limit of biomedical feasible human lifespan. Throughout the series of worlds we consider starting from the actual world, life expectancy can be such a metric used and increasing life expectancy can pinpoint highly probably future possible worlds in the vicinity of the actual world and lead further to less probable worlds until reaching the Open Life endpoint world on this path. To retain flexibility of our possible world framework another limiting world example can be when nobody is starving anymore as everybody and every family has enough on their plate. Finally we are in a position to position Open Life as a possible world with the philosophical framework of possible worlds. Since we are talking here about Open Life, the limiting concept of biomedical longevity attempts, we have roughly the following 1 dimensional scheme of possible worlds in terms of lifespans. Immortality belongs to the realm of Impossible Worlds here, not accessible from other worlds, not shown in the scheme above. Here comes the most relevant figure showing the position, the perspective from which the philosophical problems of Open Lifespan are being investigated. The modified radial plot of possible worlds focusing on the lifespan parameter and showing network topology puts the Open Life limiting possible world in the center! Making Open Life the center of possible worlds gives it the highlight it necessitates concerning our study and book. It shows the possible trajectories between Actual World and Open Life. It provides the perfect, outsider view to look at our Actual World, to understand its random (accidental) and constant (essential) features. It makes it easy to apply the Open Life filter to our current everyday life, please see our earlier Live every day as if you were ten times older: 10X principle for an Open Life. It also provides the distance but at the same time the focus to Actual World features and shows them in a light these features might not have been seen before. This is the angle we need to develop moral and political philosophy further.